I've been feeling a little anxious all day. I'm not sure exactly why. Maybe it's because I've got to ride my bike into work this evening to cover class and then I'll be riding home in the dark. I've got my visor and headlamp so I'll be able to see. 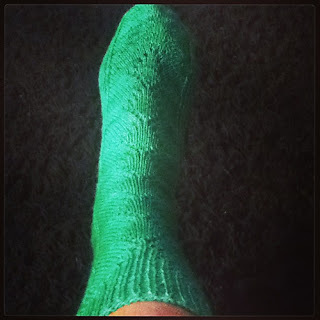 I'm also trying to finish the second Greenhouse sock so that I can qualify for the next round. I really, really want to finish these before this weekend because I don't want to be preoccupied during the Great Rhody Yarn Crawl, which starts tomorrow. I'm almost to the heel flap and I hope to make some good progress tonight in class. Also, I'm trying to buy a used car online and I think I finally got a bead on a good one. I'm looking at a used Camry with really low mileage that's priced to move. I've already declared my intentions to buy it and let them know that I've got the payment in my hands right now. Hoping to hear back and make this happen. It'll be nice to get behind the wheel again. I'll keep you posted!